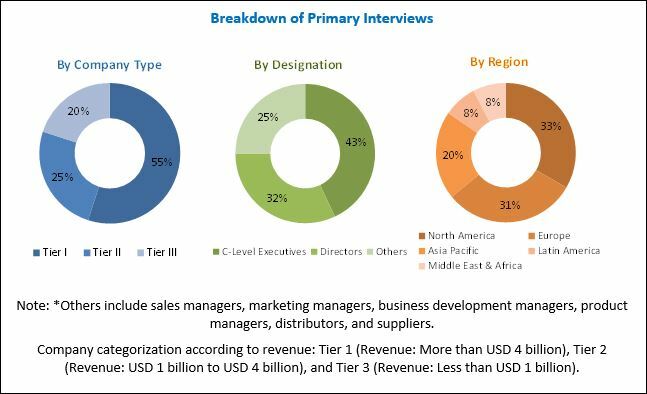 [120 Pages Report] The global thyroid function tests market is projected to reach USD 1.68 Billion by 2022 from an estimated USD 1.19 Billion in 2016, at a CAGR of 5.9% during the forecast period. Factors such as increasing incidence of thyroid disorders, increasing awareness about thyroid disorders, increasing prevalence of lifestyle diseases, rising geriatric population, and increasing consumption of alcohol and tobacco are driving the growth of this market. The base year considered for the study is 2016 and the forecast period is 2017–2022. Thermo Fisher (US), Abbott (US), Roche (Switzerland), DiaSorin (Italy), Danaher (US), Kronus (US), Merck (Germany), Cortez Diagnostics (US), bioMérieux (France), Qualigen (US), and Autobio Diagnostics (China) are the top players operating in the thyroid function test market. The global thyroid function tests market is projected to USD 1.68 Billion by 2022 from an estimated USD 1.26 Billion in 2017, at a CAGR of 5.9% during the forecast period. This growth can be attributed to factors such as increasing incidence of thyroid disorders, increasing awareness about thyroid disorders, increasing prevalence of lifestyle diseases, rising geriatric population, and increasing consumption of alcohol and tobacco. By type, the market is segmented into TSH tests, T4 test, T3 tests, and other tests. In 2017, the TSH tests segment is expected to command the largest share and grow at the highest CAGR during the forecast period. Growth in the TSH tests segment can largely be attributed to the rising burden of thyroid disorders globally. By end user, the market is segmented into hospitals, diagnostic laboratories, research laboratories & institutes, and other end users. In 2017, the hospitals segment is expected to command the largest share and grow at the highest CAGR during the forecast period. Growth in the hospitals segment can largely be attributed to factors such as high volume of thyroid function tests performed in hospital-based laboratories across the globe, growing patient population (and the subsequent increase in the number of clinical tests performed in hospitals), growing number of public healthcare awareness campaigns organized by hospitals. 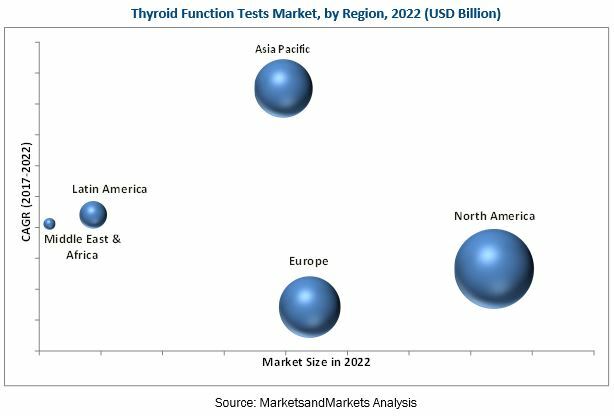 Geographically, the North American market is expected to account for the largest share of the global thyroid function test market due to the presence of an advanced healthcare infrastructure in North American countries such as the US and Canada. However, the Asia Pacific market is expected to grow at the highest CAGR in the forecast period. This growth can be attributed to factors such as the presence of a large target patient population, increasing disposable income of the middle-class population, and improving healthcare infrastructure in emerging countries such as China and India. Unfavorable healthcare reforms may restrain the growth of the market to some extent. Thermo Fisher (US), Abbott (US), Roche (Switzerland), DiaSorin (Italy), Danaher (US), Kronus (US), Merck (Germany), Cortez Diagnostics (US), bioMérieux (France), Qualigen (US), and Autobio Diagnostics (China) are some of the major players operating in the thyroid function tests market.